ON A GLOOMY MARCH AFTERNOON in 1829, 2,000 people crammed into the Assembly Hall in Edinburgh. They came in support of granting civil rights to Roman Catholics. But audience attention drifted after a series of tedious speeches by secular politicians. Then a clumsy, heavy-built, middle-aged clergyman rose to speak. The restless crowd was hushed, and within minutes, they were cheering wildly. The uninspiring figure who produced such a remarkable effect was Thomas Chalmers, professor of divinity at Edinburgh University. Chalmers was no friend to Roman Catholic theology. In England and Scotland, he was a leader among evangelicals who in this age were decidedly anti-Catholic. Nevertheless he was convinced that religious error was no grounds for political disenfranchisement. Intolerance had become an “unseemly associate” of the Reformation, he argued. True Christianity could be spread only through preaching the Word of God, and political coercion was counterproductive. At the time of Chalmers’s speech, Anglicanism was the established religion in England, Ireland, and Wales (Presbyterianism was the established church of Scotland). Consequently, Catholics, Jews, and Nonconformists (Protestants who weren’t members of the established church) were disadvantaged. In order to serve in Parliament, for example, Jews and Catholics were required to deny their faith. Nonconformists didn’t have as many restrictions against them, but they were still the object of discrimination—they were excluded, for instance, from taking degrees at Oxford and Cambridge. In the early 1800s, many evangelicals feared that civil toleration would only exacerbate the indifference to truth they believed infected England. But Chalmers, among others, championed a new idea: striving for political liberty and for spiritual truth need not be incompatible. Roman Catholics and Jews presented evangelicals with more painful dilemmas. Many evangelicals believed that tolerating those in religious error was the same as denying Christian truth. 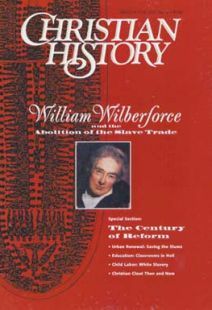 No one felt this tension more than William Wilberforce. He loathed Roman Catholicism and believed its influence was essentially evil. Jewish emancipation was also a thorny issue. Lord Shaftesbury, for instance, believed that the Jews were God’s ancient chosen people and that their conversion was an essential prelude to the Second Coming. But he felt it would be a denial of Christian truth to allow them to become legislators for a Christian nation. But other evangelicals, notably Robert Grant and Lord Bexley, believed Jewish emancipation was a matter of civil justice and a necessary preliminary to conversion. John Wolffe is senior lecturer in religious studies at The Open University in Milton Keynes, United Kingdom. He edited Evangelical Faith and Public Zeal: Evangelicals and Society in Britain, 1780–1980 (SPCK, 1995).